Here's a demo project I wrote in Unity4.3. In this demo, user can choose either use ADBannerView(Unity built-in class) or iADBannerView (the class I wrote that calls native ios code) to Create, Destroy, Show and Hide iAd in Unity scene. How to load XML files in Unity Web Player? In my Towercraft game, I need to load level/achievement information from the XML files in the Resources folder. Also the game is built in Web Player, so the XmlDocument.Load() won't work in this case. The solution is to use WWW class to load file, and then use XmlDocument to load it as string. Tower Defense + RTS game for people who like to play RTS game and like to micro units. 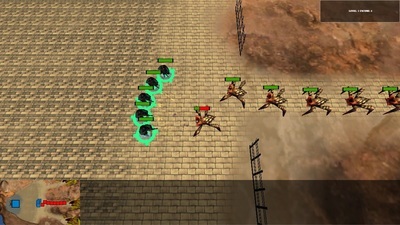 In the game, player must to control their units well enough to defend waves of enemies. In the current build, player can train units from command center and need to secure 3 waves of enemies to win the game.